California Fish & Game (CDFG) proposes giving agricultural operations in the Shasta and Scott Sub-basin of the Klamath River a virtual exemption from the California Endangered Species Act (C-ESA). The irrigators dewater the Scott and Shasta and, in drought years, Coho salmon, listed as “threatened” under the C-ESA, are among the fish killed. The proposed permit will not lead to Coho Recovery; it will allow dewatering to continue and put irrigators in charge of monitoring their own C-ESA compliance and reporting violations. In the Klamath River Basin these days environmental news is dominated by talk about dam removal and, occasionally, new restrictions on fishing. But now another issue is poised to compete for the headlines. The California Department of Fish and Game (CDFG) announced late last month that it plans to give a hundred or so farmers and alfalfa ranchers in Siskiyou County just south of the Oregon border an exemption from the California Endangered Species Act. Released without fanfare, the announcement caused barely a ripple in the regional media. But below the surface a virtual tsunami may be forming. 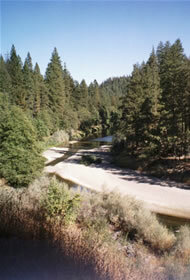 The Scott and Shasta Rivers are major Klamath tributaries. While salmon runs in these rivers have been depressed for many years, fisheries scientists and restorationists agree that the broad valleys and forested streams of the Scott and Shasta have the greatest potential among all Klamath tributaries to produce salmon. Furthermore, the Scott River in particular could be the key to recovery of Klamath River Coho salmon. While all Klamath Basin salmon stocks are “at risk of extinction” according to the American Fisheries Society, only Coho are listed as “threatened with extinction” under provision of the California Endangered Species Act (CESA). Klamath River Basin Tribes, conservation and fishing groups have been nervous about the closed door meetings. As downstream interests, they asked to be included in the talks only to be rebuffed by CDFG and the irrigators. Now the reasons for the secret meetings are beginning to come to light. While the actual Endangered Species Act exemption – technical known as an “Take Permit” - has not been released pending review by irrigator and state lawyers, preliminary environmental documents indicate that, while ranchers and growers will exclude fish from irrigation ditches, they will be allowed to continue dewatering the Scott and Shasta Rivers. If fish need water, the environmental documents indicate, the irrigators will consider renting water to CDFG on an annual basis. In return the CDFG will continue to have access to river sections that pass through private ranches and alfalfa fields – something that some ranchers have denied to CDFG since the Coho were listed as threatened. There is every indication that the Take Permit CDFG has negotiated with the irrigators will not adequately address the critical issue of river flows. Flows in the Scott River have become so low that many salmon can not reach prime spawning grounds in dry years. According to the California Department of Water Resources 54% or irrigation in the Scott River Valley is now done with water pumped from groundwater. The pumping – which began in earnest in the 1970s and has grown ever since - is unregulated. The proposed Endangered Species Act exemption will do nothing to bring irrigation pumping under control. Under these circumstances, experts expect the dewatering of these rivers to continue. What warden Cleland didn’t say is that Coho salmon were among the fish that died when irrigators dried up the river that year and that the practice of looking the other way was not new but had been the rule for as long as anyone could remember. The failure of state and local officials to enforce basic California laws designed to protect fish in the Shasta and Scott River Basins is but one of the secrets which one can discover below the surface of Klamath Basin water politics. But this one is likely to attract more attention than the California Department of Fish and Game would like. That’s because not only have these state officials negotiated in secret with private parties, they also propose turning over their responsibility to oversee enforcement of the California Endangered Species Act to a local non-elected board made up of the very ranchers and farmers who would be the beneficiaries of the California ESA exemption. Under the terms of the proposed Take Permit, the Siskiyou Resource Conservation District would be in charge not only of “monitoring irrigator compliance” with provisions of the Take Permit but also with reporting non-compliance to Fish and Game officials. In effect, the very people who are the beneficiaries of the permit would be in charge of monitoring their own compliance and of reporting violations. Turing over California Endangered Species Act compliance to a locally-appointed board made up of farmers and ranchers would set an important precedent and one with great potential to negatively impact California’s rarest and most at risk species. That is why the proposed Take Permit is likely to attract opposition from conservation, wildlife and fishing groups that until now have not been involved in the Klamath River Basin. Involvement of new players is what it may take to stop the dangerous CESA precedent in its tracks. It is rumored that state officials have approached other Basin interests suggesting that the proposed Scott and Shasta California Endangered Species Act exemption be part of a broader Klamath River deal that includes dam removal. The usual defenders of Klamath River salmon want CDFG’s support for Klamath dam removal and may be willing to look the other way on the Take Permit in order to solidify support for dam removal. Meanwhile Coho salmon remain at risk. As I write this article, Coho are holed-up in the Scott River canyon waiting for rain to restore flows in the dewatered Scott River so that they can reach their spawning grounds. Coho in the Scott and Shasta remain at high risk; in two years out of three the spawning populations are well below the 200-300 spawners scientists tell us are the minimum numbers needed to maintain a salmon run over time. And year by year – as unrestrained and unregulated groundwater pumping continues to expand - flows in these rivers are less and less for a given amount of rainfall. No one knows how long these conditions can continue before Coho go extinct in the Scott and Shasta – the Klamath tributaries where they once were most abundant. One thing, however, is certain: If the hundred or so ranchers and alfalfa growers and their political supporters get the Take Permit they seek, the demise of Scott and Shasta River Coho salmon will be one giant step closer to becoming reality. The author has resided in the Klamath River Basin since 1975 and has been involved in salmon restoration and salmon politics since 1986.